Lots of people surf the net and keep up with their social networks while watching television—and media portal AOL wants to make sure they’re doing those things via AOL. 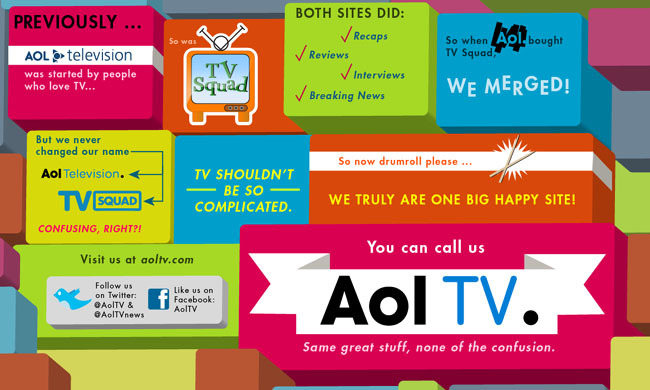 Today the company launched a revamped version of its AOL TV—all powered by technology from startup i.TV. The new site features rich, interactive televisions listings, more video integration so users can see previews and clips of shows, and mobile applications for iOS devices so users can keep up with programming and even program their DVRs on the go. “By significantly upgrading AOLTV.com, in partnership with i.TV, we’re providing users with the simplest and most engaging tools to enhance and manage their TV viewing across all platforms—Web, phone, tablet, and TV,” said AOL Entertainment senior VP Kerry Trainor, in a statement. The revamp is both a rebranding of AOL’s AOL Television and TV Squad properties, combined with new technologies and mobile apps from i.TV. AOL promises the coming months will see a major revamp to its basic TV listings—which the company notes haven’t really changed much since they were introduced in printed form in the 1950s. AOL TV’s new listings will feature social “check-ins,” personalized channels lists, calendar views, and DVR programming, all aiming to make it easier for users to find what they want to watch, discover new shows, and find out news and information about their favorite programming. AOL also promises its working on a new filtering system that will enable users to (once again) pull up shows by type. In semi-related news, AOL’s recently-acquired Huffington Post has launched its first international edition—in Canada. The site follows a template that will be familiar to existing HuffPo visitors, offering aggregated information from other sites along with “original reporting,” community forums, social tools covering a wide variety of topics and communities. AOL is also bringing Canadians on board to operate HuffPost Canada: former Globe and Mail editors will run the Canadian site, while Indigo founder and former CEO Heather Reisman will be editor-at-large.